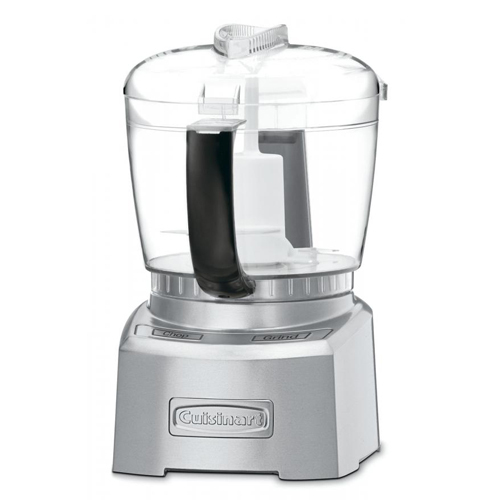 The Cuisinart 4-cup Chopper/Grinder is an appliance for effortless handling of a variety of everyday food preparation tasks. Its durable 4-cup work bowl provides ample space for many everyday kitchen tasks such as grinding, pureeing or chopping . The unit's auto-reversing SmartPower blade comes with a sharp edge for chopping and pureeing soft foods, plus a blunt edge for grinding up nuts, spices, and other harder foods. It has a unique BladeLock system keeps the blade securely in place during operation and when pouring. It also features touchpad control panel,an easy-grip handle, and dishwasher-safe parts for quick cleanup. The 4-Cup Chopper/Grinder Die Cast has many exciting features for users of all types. You can extend the lifetime of your 4-Cup Chopper/Grinder Die Cast with the purchase of a FactoryOutletStore Factory Protection Plan. See the 4-Cup Chopper/Grinder Die Cast gallery images above for more product views. The 4-Cup Chopper/Grinder Die Cast is sold as a Brand New Unopened Item.